Can anyone tell me what is wrong with this picture? Hint: Today is April 20. My backyard should be turning green. The snow keeps coming. Grrrr. well that's just sad. very sad. you need to live in bc. we had a nice sunny day today and went for a walk after church. And coming... and coming... and coming... And shouldn't that be "brrrr"?!! I can't believe it's been three solid days plus!! I'm from the Westlock/Barrhead area, so I'm right with you. The school bus driver called at 6:30 this morning to say the buses are not running. The schools are closed. So my husband felt quite justified, and probably wise, letting his boss know he was not going to risk the 110 km drive in to work today! 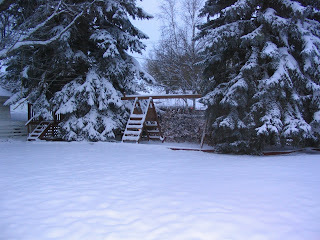 Sorry you are not having green sunny days - but what a beautiful picture - i love the snow and the way your yard looks so - so - neat as a pin and the trees are just lovely!